Well there was two more ticks today – a few problems with both challenges but I think Kathryn has passed both with ticks. After doing The Great South Run which I will always be proud of doing and will always be grateful for Kathryn setting me this challenge, today’s challenge of running a 10k run with Kathryn should have been just a run in the park! Unfortunately my body had other ideas! I had been determined to prepare for this run and make sure I did 10k practice every month. January 1st was my first 10k of the year so I was on to a great start. I was running regularly in April but after a run on April 29th, I found myself limping. I had a pain in the bottom heel area of my right foot. I carried on walking to work but it got very painful. 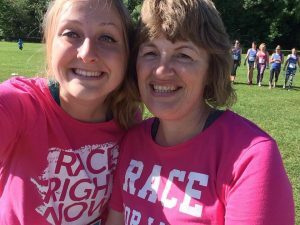 With my race for life 10k run looming, it was not good news. I did manage to go to zumba and tried to take it easier than normal but managed to hurt my knee! It was great yesterday when I had my first day without a limp so I was hopeful that I would be able to run today. 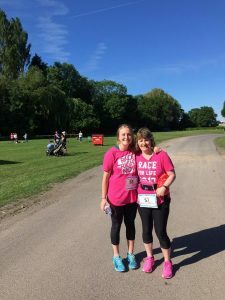 Finding a 10K run before Tuesday proved difficult locally so today’s run was for a great cause, Race for Life, at Royal Windsor Racecourse. It did mean a very early start with Chris driving us up at 7 a.m. Luckily the day was gorgeous and the venue for the run was stunning. Before the start of the race there was a guest speaker from a survivor of cancer; a great inspiration as to why we were running this race. After a warm up, we found ourselves near the front for the start of the run. I would love to say I ran the whole of the race but with being a bit out of practice and the heat of the day, I did have to ask Kathryn to walk a few times (okay more than a few times!). I was a bit disappointed that I didn’t run all the way this time but it was great running with Kathryn and running for such a great cause. I do have a bit of pain in my foot but not as bad as previously. Once it is fully healed, hopefully I will take on another running challenge. My second tick today was challenge number 35 – DVD night with your kids (one film chosen by each). This has been very difficult to arrange with Kathryn being in her final year at university and Jordan back in London and having restricted time at home. We decided to change to just one film and all of us sat (well collapsed) in front of the TV this afternoon and watched Kathryn’s choice, Me Before You. Kathryn and I had seen this at the cinema but it was just as emotional watching it the second time. It was a hit with Chris and Jordan too. I still want to watch the film I would have chosen so we will find some time in the next couple of months. One of my favourites, and one that Jordan and Kathryn haven’t watched, Sixth Sense. I only have 8 more to do but with only a few more days, can it be done! I will have a good try.